Texas squirrel removal is a process that usually involves a house or building, a pesky squirrel, and an unhappy home owner! Squirrels will start to dig into people’s houses in the early months of the winter, often as early as September to start looking for a place to have their babies. Squirrels give birth to young several times a year and they will look for a home they can make comfortable to live throughout the year and have babies in. This usually occurs in the attic portions of a home, or possibly sometimes in a wall cavity. Squirrels in Texas will have babies twice a year, usually in the fall of the year, then again in the early to mid spring. This usually takes place in Feb-April and then in the fall its September thru Mid November. These time frames can be off a little and it is possible for squirrels to have babies any time of year in Texas. With Texas’s mild climate and less than harsh winter these animals can produce litters of babies 365 days a year. You should never let animals stay in your attic; they cause over 10 billion dollars worth of damage annually in the United States alone to homes and buildings. Our expert Squirrel Removal technicians remove Squirrels and their nests and prevent stress or injury to them. This is also a practical and economical approach. Removing breeding Squirrels may leave the babies to die in your building, attracting unwanted bugs and parasites, causing further health risks. The removal of Squirrel carcasses is a time consuming, costly and unnecessary process. There are several different types of squirrels in Texas that will make its self a nuisance wildlife problem. 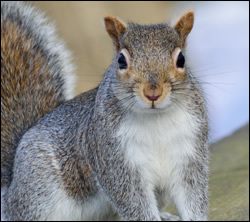 The grey squirrel is the most recognizable squirrels that is often see roaming about homes and neighborhoods in search of food. The second types of squirrels that are found in Texas is more secretive than the Grey squirrel, these are called flying squirrels. Flying squirrels are small rodents that have flaps of skink tucked under their bodies, these will jump from a high structure and glide to its destination. Sometimes as far as 300 feet in one jump. These are truly remarkable animals. They kind of resemble the domesticated sugar glider. Another type of squirrel in Texas is the Fox squirrel, something like the grey squirrel, it’s bigger in size and the coloration is deeper and its carries a rusty color, these animals are not usually considered a wildlife problem, as they do not dig into homes and attics like the grey squirrel does. They are usually found in meadows and fields in old growth timber. Their diet consists of the same food as the grey squirrel and flying squirrel; however their habits and disposition are far different. And Last but not least is the red squirrel, Kind of the same color as the Fox squirrel, but much smaller in size, the red squirrel is sometimes referred to as a fairy diddle. These small squirrels almost resemble a chipmunk and are very fast, sometimes living in rock outcroppings and other times living in tall trees, you can find the red squirrel in pine groves and hardwood stands throughout the state of Texas. If you have any question about these types of squirrels, just click on the link of their names and you will be taken to the page for that specific animal. If you have problems with these animals, just click on the city at the bottom that best represents your location in Texas to find the most qualified squirrel removal, wildlife control operator in your area.